I went to the Durham Hub Farm yesterday to pull some weeds around fencing, and check on my plot sizes and dimensions (I am calculating the amount of seed that I need). I took two large bags of fresh weeds home for my expanding guinea pig collection, and on the way home, picked up two new females. Another set of well cared for, 2.5 year old girls. They are on the old end of the breeding spectrum. I got a whole bunch of bedding, food, and hay. Once again, Craigslist was good to me. Both of these girls have interesting hair, and came from a home that they got to run around and free range, so these people didn’t think I was weird when I mentioned free range guinea pigs. 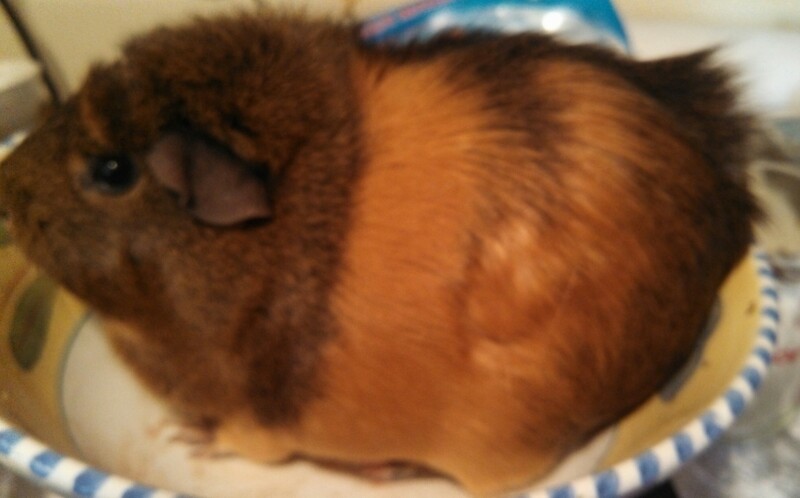 Pink: This is a 2.27 lb Guinea Pig that has a ridgeback. This essentially means that she has a Mohawk down her spine. This is why I named her after one of my favorite singers, who also has supported a Mohawk at some point during her career. This is Pink, a 2.27 lb caramel and chocolate female with a mohawk. 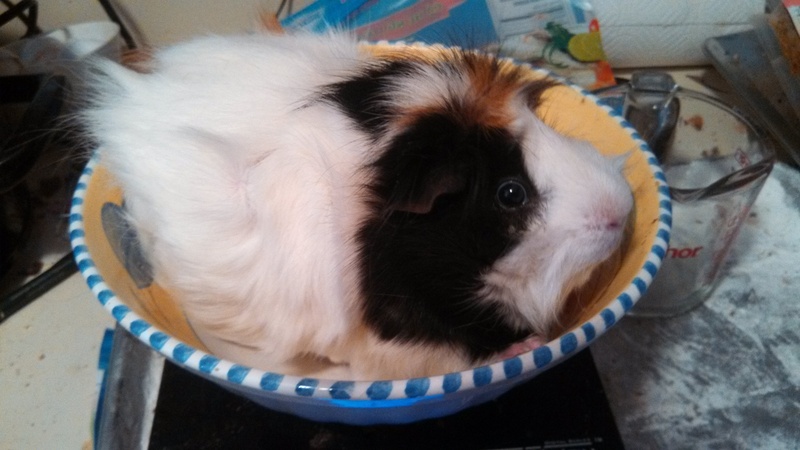 Rose: This is a big girl, another 2.73 lb guinea pig. She is a typical Abyssinean breed guinea pig, which means that she has rosettes all over her body (that look just like cowlicks). Frankly, I think the breed is kinda hideous, but she is a very outgoing pig, and is super sweet. I also put Caramel and Cadbury in with the lovely, silkie, Shiny. I am also fixing to take out the breeding male from the other five guineas some time in the next week. This puts my total guinea pig count at 13 females, and 2 males. I am almost done with the permanent outdoor housing system, waiting to find some linoleum to line the bottom of the plywood box.